Venturing into the literal wild, new staff leave the safety of their monkey-less roads and tackle the great unknown we call Woodstock. The Woodstocker caught up with some of them to chronicle the first chapter of their adventures. Before even considering working in India, Mr. Dinesh Ayyappan and Ms. Leaf Elhai visited the country in December 2016, only six months after their wedding. They visited his family, not realizing that soon they would live and work here. Eighteen months after that visit, they’ve joined the Woodstock community. Ms. Leaf teaches sixth, tenth, and eleventh grade English, while Mr. Dinesh teaches Middle Years math and design. 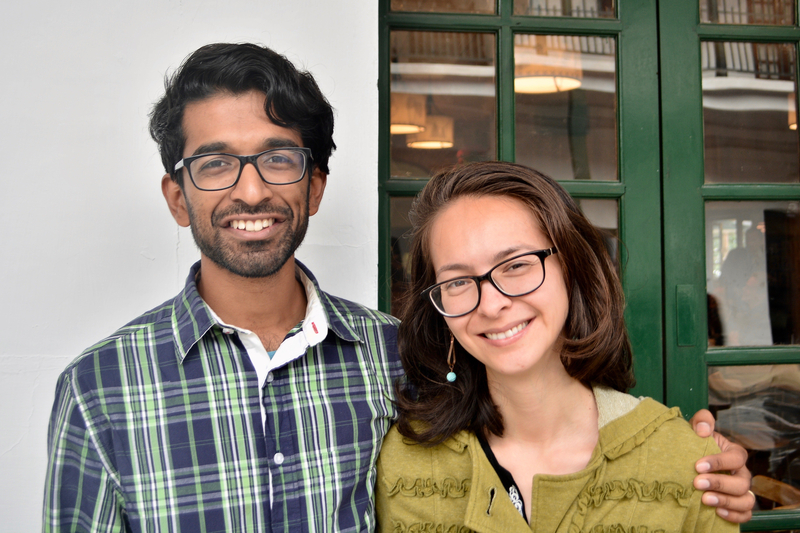 Coming from teaching public schools in Boston, they have encountered a new experience in Mussoorie. The most striking thing to them, of course, is the profound sense of connection with nature. Mr. Dinesh shares her enthusiasm. Surprisingly, they don’t mind the monkeys. Another interesting thing that stands out to them is the respect that teachers receive here, something that was often missing at their previous schools. Also new to them has been the time in the classroom. Whereas the two taught for about 25 hours a week in Boston, here, they have to teach only 17. Although their experience here so far has been largely positive, there have been some challenges along the way. Since Ms. Leaf teaches English to a wide range of grade levels, it often becomes difficult to switch between the widely different needs of the three grades. However, she plans to deal with this optimistically, too. Mr. Dinesh shares similar hopes about teaching. The two also look forward to their extracurricular plans. Mr. Dinesh will be leading the robotics and programming extracurriculars. Using his game development skills, he plans to add a unique twist to the programming PASSAGE. Just last year, Mr. Dinesh learned how to make video games. The first video game he created was about running a newspaper. Mr. Dinesh worked with a team to create the game in 48 hours for a contest of political games. Themed “unreality,” the contest was held in Boston and run by the German government. Mr. Dinesh’s team was a finalist that made the top three. Called “You Are What You Read,” the game is played from the perspective of a newspaper editor. The player is given a choice of five articles, from which three are chosen to make the cut. The articles are pulled directly from polifact.com. Each article has an assigned truth and popularity score. Meanwhile, Ms. Leaf will be leading the Visual Arts PASSAGE and the Honor Council. She herself was on her school’s Honor Council for two years. “I’m curious to learn more,” she said. She has also started working with the Journalism PASSAGE. Mr. Dinesh and Ms. Leaf are excited about everything the school offers. To Mr. Dinesh, the International Baccalaureate (IB) philosophy and wider teaching opportunities came as a special attraction. The school’s philosophy also intrigued Ms. Leaf. Another reason they chose Woodstock was that they are situated closer to Mr. Dinesh’s family, who reside in South India. Although he comes from an Indian background, Mr. Dinesh doesn’t feel connected enough to his culture. He doesn’t have a strong hold of Hindi either. But here at Woodstock, he plans to change this.